Alluvial terraces from the Pliocene epoch consisting of pebbles, cobblestones, fallen rocks, and boulders based in limestone soil. End of September at full maturity of our oldest vines of Syrah and Grenache, 50 years or older. Syrah (50%) and Grenache (50%). Traditional vinification of each varietal; destemmed after harvest. Fermented in concrete tanks with controlled temperatures between 25° and 30°C. Fermentation for 21 days with frequent pumping over and rack and return to achieve a good extraction. Wine is aged in concrete tanks for 18 months before bottling. 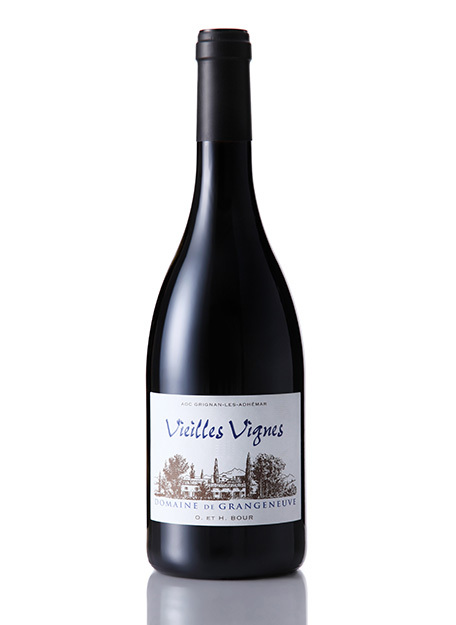 Intense nose characterized by small red and black fruits (like cassis), licorice, and “garrigue”. A beautiful palate - rich, full, and soft with good balance. This wine is powerful but harmonious with tannins that are present but elegant and silky.